Today, Agenzia Fides, an information service of the Pontifical Mission Societies is reporting an interview of the spokesman for the Egyptian Catholic Bishops. The interview is with Fr. Rafic Greiche. 58 churches and Christian institutions were attacked and set on fire in Egypt in past days. This was reported to Fides Agency by Fr. Rafic Greiche (pictured left,) spokesman of the Catholic Bishops of Egypt. “Out of 58 churches attacked 14 are Catholic, the rest belong to the Coptic Orthodox, Greek Orthodox, Anglican and Protestant communities” says Fr. Greiche. “The attacks against the churches took place all over the Country, but are concentrated especially in the areas of Al Minya and Assiut, because it is there that we find the headquarters of the jihadists (radical muslims,) responsible for this violence,” adds Fr. Greiche. 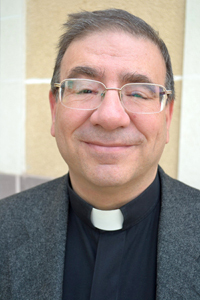 “This is not a civil war between Christians and Muslims”, emphasizes Fr. Greiche. “It is not a civil war but a war against terrorism. And the majority of the population is against terrorism and religious extremism”, concludes Fr. Greiche. Click here to read this article at Agenzia Fides’ website. This entry was posted in 2013, Peter L. Hodges Sr. and tagged Agenzia Fides, Catholic, Catholic Church, Egyptian Catholic Bishops, egyptian revolution 2013, Muslim Brotherhood. Bookmark the permalink.